Snap, an adopted Greyhound who belongs to one of the Shelter's foster families, has been out every morning spreading the word about the upcoming Greyhound Protection Act vote. 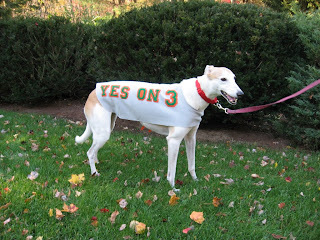 Please vote Yes on 3 and stop Greyhound racing in Massachusetts. These graceful, sweet, lovely dogs deserve so much better. There has been a lot of misinformation spread by the opposition, so if you are not familiar with the ballot question, please take a look at the facts before going to the polls on Tuesday. Snap looks like a wonderful dog. I saw her in Dover during the election yesterday and took her picture. It was featured on a few blogs. I hope she had something to do with "Yes on 3's" victory.